The conventional residential swimming pool pump uses electricity from the grid. It can cost 3 to 4 times more in the Bahamas & across Caribbean to power a pool pump where electricity costs are much higher per kilowatt hour. If that pump can be replaced with one that doesn't require electricity from the grid, the pool owner can use that savings to pay for the cost of a solar powered pool pump. SunRay Solar Pool Pumps can power your pool water filter system for free using the energy of the sun, operates with zero electrical costs and is virtually maintenance-free. 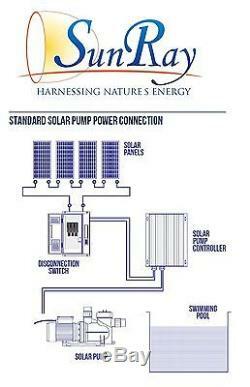 Power your pool water system for free using the energy of the sun. 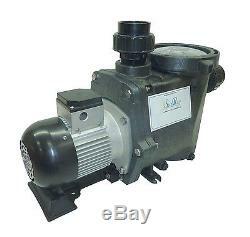 The average life of a conventional pool pump is 3 to 5 years. 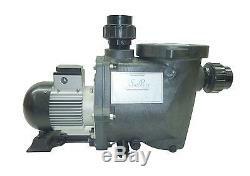 The life expectancy of the SunRay pool pump is 10 or more years. 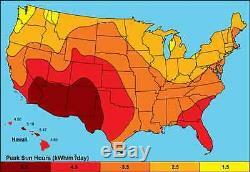 The average life expectancy for photovoltaic panels is more than 40 years. The SunRay Pool Pump System. Operates with absolutely zero electrical cost. Completely eliminating the need to pay for electricity to run the pool pump. 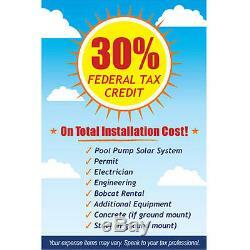 Our Solar Pool Pumps are virtually maintenance-free for residential & commercial use. The solar pool pump is powerful enough to operate with existing pool heaters and automatic pool cleaners. Each kWh produced by coal-burning power plants contributes 1.9 pounds of pollutants to our atmosphere! On average, our pool pump saves 11,000 pounds of pollutants each year from entering the atmosphere. The SunRay Solar Powered Pool Pump system can increase the value of a home up to 20 times the annual electrical savings. Pre wired & tested before packing. Ready to install out of the box! DC GFCI (Disconnect with built in lightning arrestor). 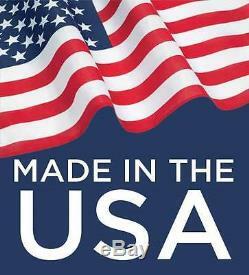 Tested and certified by the F. SunRay Pumps are designed and manufactured in Dana Point, California USA. 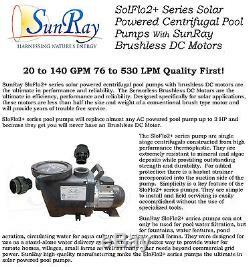 SunRay Solar Powered Pool Pumps. The SunRay line of Solar Products are all designed to be off the grid systems for effectively moving water using solar power. Our engineering and manufacturing experience allows us to use the latest solar technology to create systems for today's consumer needs. SunRay SolFlo1 - 1HP - 1.5HP Brush Type. Recommended for 500 to 30,000 Gallon Swimming Pool, Spa, Pond or Open Water Environment. 1HP Solar Pool Pump, Up To 100GPM, 50FT Head, 90VDC, Brush Type Motor - Very Quiet Running Motor - Use 2 solar panels 60VDC wired in series for small above-ground pool or ponds for 500 - 5,000 gallons water filtration, to 3 solar panels 90VDC wired in series for up to 3,000 - 25,000 gallon ingrond pool for filtration. 1.5HP Solar Pool Pump, Up To 120GPM, 60FT Head, 180VDC, Brush Type Motor - Very Quiet Running Motor - 6 panels wired in series for pool or ponds for 15,000 - 30,000 gallons water filtration. SunRay SolFlo2 - 1HP Brushless. Recommended for 500 to 15,000 gallon swimming pool, spa or pond. Use 4 120VDC watt panels wired in series for up to 15,000 gallon pool filtration. SunRay SolFlo3 - 2HP Brushless. Recommended for 15,000 to 30,000 gallon swimming pool or pond. SunRay SolFlo4 - 3.5HP Brushless. Recommended for 25,000 to 100,000 gallon swimming pool or pond. Use 16 panels 240VDC wired in series for up to 115gpm at 25 psi/ 58' lift or for up to 100,000 gallon pool for filtration. Please share with a friend! If you have or know someone with a Commercial Swimming Pool, Residential Pool or Water Features, let us know! 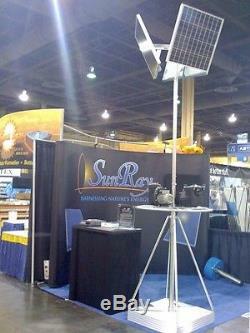 It's what we do - SunRay Engineering. The item "SOLAR POWER DC POOL PUMP SunRay SolFlo2 2 Solar Panels 60VDC Filter Pump" is in sale since Saturday, August 20, 2016. This item is in the category "Home & Garden\Yard, Garden & Outdoor Living\Pools & Spas\Pool Equipment & Parts\Pool Pumps". 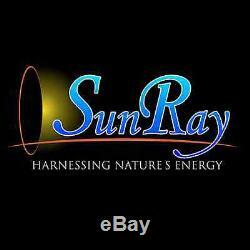 The seller is "naturalcurrentusa" and is located in Dana Point, California. 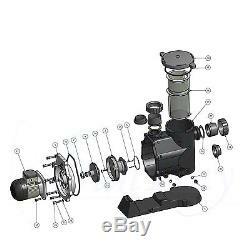 This item can be shipped to United States, United Kingdom, Denmark, Romania, Slovakia, Bulgaria, Czech republic, Finland, Hungary, Latvia, Lithuania, Malta, Estonia, Australia, Greece, Portugal, Cyprus, Slovenia, Japan, China, Sweden, South Korea, South africa, Thailand, Belgium, France, Hong Kong, Ireland, Netherlands, Poland, Spain, Italy, Germany, Austria, Israel, Mexico, New Zealand, Singapore, Switzerland, Norway, Saudi arabia, Ukraine, United arab emirates, Qatar, Kuwait, Bahrain, Croatia, Malaysia, Brazil, Colombia, Panama, Jamaica.